Buzzing around Instagram and online freeze drying groups, I see a lot of photos of people showing off their home freeze dried goodies – and a lot of freeze drying mistakes. We got our home freeze dryer earlier this year, and it's pretty easy to use, but there are some things you should avoid to get the best results for your food and your freeze dryer. Some of these tips are for flavor, some shorten your drying time, some avoid messes and a few are real safety issues. Just like in the rest of the kitchen, you want to avoid cross contamination to prevent the spread of e coli and other bacteria. Scientists use freeze drying to preserve bacteria samples. This means your odds of any bacteria on your raw meat surviving the freeze drying process are pretty high. During the freeze drying process, water vapor moves around the freeze drying chamber. (The sublimation process takes the water in the food from frozen to vapor, skipping the liquid state.) Please don't mix foods like fruits and vegetables that are intended to be eaten raw with raw meat. If you wouldn't mix the foods on a kitchen cutting board, don't mix them in the freeze drying chamber. There are a number of sources that say you can mix and match even strong flavored foods in the vacuum chamber, as long as you put the strong flavored food (like onions) on the top shelves. I'm telling you otherwise. Maybe those folks have wonky taste buds, but when we freeze dried green beans and bananas in the same batch of food, we ended up with green bean flavored bananas. The flavor was subtle, but it was definitely there (and green bean bananas do taste as bad as they sound). Since then, we've been careful to keep sweet and savory foods separate, with good results. Some foods like very high sugar content fruit, jams or jellies do not freeze dry well. No matter how long you leave them in, they will still be a little (or a lot) sticky. This is because sugar binds to free water molecules, preventing them from escaping the food. Normally, this trait is helpful for food preservation. Binding up free water slows down bacteria and mold growth, because those microorganisms need water to thrive. Unfortunately, it results in a less than ideal freeze dried product. How much sugar is too much sugar? The good news is that most plain fruit still works very well, although sweeter fruits like peaches or pineapple will likely require a longer drying cycle. The only fruit I've tried so far that took a very, very long time and still came out tacky was pears. There's a reason I refer to my dehydrated pears as “pear candy“. I'll stick to dehydrating those, since the freeze dried pears came out very similar in texture to the dehydrated pears. Just skip the jams, jellies and other fruit spreads. One of the first freeze dryer reviews I read was from a fellow who attempted to freeze dry butter. He ended up with a massive mess. There was butter coating every surface on the interior of his freeze dryer, and it took a very long time and lots of work to clean up. Of course, this got me wondering how much fat is too much fat, so I tried some pre-cooked, frozen breakfast patties. Never again – at least not unless I heat them up and remove as much fat as absolutely possible before freeze drying. Like the first gentleman, I ended up with fat coating much of my freeze dryer. Even after a good scrubbing, it took weeks for the odor to fade completely. (Thankfully, other foods did not pick up the odor.) The flavor of the finished product was a lot like sausage jerky, and they didn't rehydrate very well (see next mistake). Still, if you were hungry, I'm sure they'd be delicious. Fat will also go rancid more quickly than other food items, so a meat or dairy product with higher fat levels is probably best used within 5 years. Make sure that if you want to freeze dry meat products that as much fat as possible is removed before drying. Full fat dairy such as whole milk, sour cream and cheese work just fine. Small pieces of meat also make tempting snacks. (Our strips of fajita beef tasted like meat flavored cheese puff snacks AKA “meatos”.) Just make sure you don't eat too many dried pieces without drinking plenty of liquid so your internal plumbing doesn't get backed up. The first time I loaded up my freeze dryer, I didn't bother with liners for the pans. After all, they're stainless steel, non-reactive and food grade. Not a good idea. Like a kid with their tongue stuck on a metal flag pole, my freeze dried goodies did not want to come off the pan. If you let them set around until the pans warm up, there's a risk that they will start absorbing moisture from the air and get soggy, ruining your freeze drying efforts. (Winter hasn't been bad, but in summer, when the humidity is sky high, this is a real issue.) Invest in some sort of liners and save yourself a lot of headaches. I purchased sheets of reusable parchment and cut them to size. You can also use regular parchment paper, too. With care, you should be able to use it for a couple of loads. Wax paper and plastic wrap are a little too flimsy, and I wouldn't recommend aluminum foil because of the long exposure to aluminum for your food. Just like your air conditioning, your freeze dryer has to to work harder the hotter it gets. Higher temps add hours to the drying time – sometimes many, many hours. Our unit is in our attached garage, which is insulated but not air conditioned. When the heat and humidity go up (80°+F), I take a break from freeze drying. If you live in an area where it's almost always hot and/or humid, I'd put the freeze dryer in an air conditioned space. Also, don't operate the unit below freezing. You will very likely have water within the compressor (which is normal) but below zero it can freeze and destroy your compressor. For fruits with tough skins like grapes, cranberries, cherry tomatoes and blueberries, extra minutes of prep time will save hours of freeze drying time. Grapes are typically sliced in half lengthwise (like folks with smaller kids probably already prep them). We prep cherry tomatoes the same way. For blueberries and cranberries, I freeze them on a baking sheet before freeze drying, and then give them a very brief spin in a food processor. The goal is to nick the skins ever so slightly so water can escape, while leaving the fruit intact. I've also seen folks poke holes in individual berries, but the pre-freeze method is much faster. It's a simple thing, but may be easy to miss. Liquids spill. So – if you want to load up a tray of something like soup or milk, it's best to limit how far that liquid needs to travel in the tray. Get your try in the freeze dryer, and then pour the liquid in – or load it right next to the freeze dryer and transport it inches instead of feet. Each tray will hold about a quart. This is another problem that I see regularly – people mixing different shapes and sizes of foods, and stacking them unevenly on the trays. Big chunks will still be cold in the middle (and not completely dry) long after the small bits have finished. A photo taken with a thermal imager will clearly show cold blue spots where the food isn't completely dry. Food stacked too deeply has a heck of a time dumping that water from ice to vapor. The top layers slow down or prevent sublimation from the lower layers. Chop your food thin and/or small for the fastest drying time, and spread it evenly on the trays to prevent cold spots. Most of these tips apply to dehydrating foods as well. Use common sense in the kitchen, and you'll get good results and safe and tasty food. 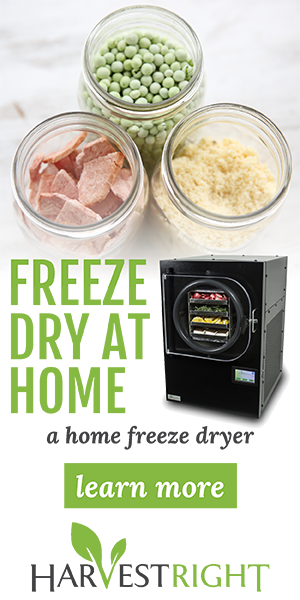 Do you have any questions about home freeze drying? Leave a comment and let me know. We've had our unit for a while now, and find it to be a useful addition to our home food storage options. I am an affiliate for Harvest Right Home Freeze Dryers, so if you buy through my site I receive a commission at no extra cost to you. As always, all opinions are my own. As far as I know, Harvest Right is the only company making home freeze dryers, but if you find out otherwise, let me know. You can read more about our freeze dryer in the post, “Home Freeze Drying – The Good, The Bad and The Ugly“. For tips on on how to optimize your freeze dryer use, check out “Harvest Right Freeze Dryer – Cost Analysis and Optimizing Load Size“. Hi Lori. I am so glad to read your posts about freeze drying. We purchased one this past summer (sorry, before I found out we could purchase through you), and I am working my way through a lot of misfires and confusion. You have answered many questions that have come up during my freeze drying episodes. Blueberries, for one. I couldn’t figure out why even after adding extra drying time, my berries were sticky and still wet inside. Now I know. I still don’t know why my first batch of bone broth was picture perfect and the second one ended up with two of the trays still cold and wet. I checked one tray that was good and thought it was OK to turn off the dry cycle only to discover some of the broth wasn’t done. This wasn’t the first time I thought a batch of something was done only to find out too late that it needed more dry time. I tried freeze drying sour cream and was really happy with the results. However, I haven’t been able to re-hydrate it back to sour cream again to everyone’s satisfaction. I hope I can get the hang of the machine well enough to justify it’s price. Right now, I’m not sure that will happen. I am much more comfortable with my two canners and dehydrator. Another problem I have is getting a good seal on the door. Two times I have had an issue with the vacuum pump spraying oil all over everything because it couldn’t achieve a vacuum due to a bad seal on the door. The first time it happened in the middle of the night and I found it the next morning. What A Mess!!!!!!!!! After that, I had to figure out when to start a batch so I would be able to watch it when the cycle went to vacuuming. I caught it the second time it happened and was able to minimize the mess. The owner’s manual leaves a lot for you to figure out for yourself. A couple of times I have had a message on the screen that some connection inside the machine had come apart and I needed to reattach it. I tried to find it in the manual….no luck. I crossed my fingers and touched the screen saying I had fixed the problem. It finished freeze drying and drying like nothing was wrong. I gotta be honest; I am at about 4 out of 10 for overall experience with this machine. I sure hope it gets better as I get smarter. I’m with you on the owner’s manual leaving a lot to be desired, and we’ve had the oil sprays, too. One tip I’ve found that helps with that door seal. I noticed that each time I freeze dry, that fat rubber gasket gets a snuggy from the vacuum pressure. This should be a good thing – BUT – if you look at the door right after you close it, you’ll see areas where the gasket presses tight, and areas where it does not. So now before each load starts up, I ease the gasket off just a hair all the way around, and make sure that a smooth ring of contact is visible against the glass. This has pretty much eliminated incidents of not achieving vacuum. When I did my broth, I didn’t fill my trays completely full. Some people do (I’ve seen it on the groups), but that seems like a lot of liquid. I haven’t tried sour cream yet, but I suspect it would be best camouflaged in something like stroganoff. Putting it in a high speed blender may also help, but of course if you’re using it during a power outage, that won’t likely be an option. Like my breakfast sausage, if you’re hungry enough, it’ll be tasty, whereas some freeze dried foods are downright delicious. Thus far my favorites are the simple stuff like plain fruit and meat. The boys really liked the yogurt drops, too. Don’t be afraid to contact Harvest Right. They need to get feedback on any problems that come up so they can continue making improvements. This is a relatively new product in the grand scheme of things, and there are obviously still bugs to work out. Because of the extremes of temperature and pressure that the machine needs to achieve, it takes a lot more stress than the average appliance. Every person who sets one up in their home will have slightly different conditions. If we don’t tell them what we need, they won’t know. The sock cover does indeed help. Since we’ve been measuring, we’re pretty much eliminated the spray. I use a coffe filter for overspray and i always make sure i dont overfill my oil. Once was enough for me. A tip I’ve found to be helpful, is to start the freeze dryer, immediately hit the clock button so that it goes to dry and let the vacuum run for a minute to make sure there is a good deal. Then hit the clock again, select no defrost, and start the freezing process over with the seal in the door intact. It’s especially helpful for when it’s night or I’m not going to be home! Good luck! Just don’t do this with liquids that are not frozen solid. Big mess. YES!!!! for sure!!! I tried that with raw eggs…. what a mess, eggs all over the inside… on the trays, the rack, the drum. The liquid eggs (or any liquid for that matter) will boil once a vacuum starts if not frozen. Then then if the drum is cold it will freeze to the drum. Arg…. what a mess, will never do that again. GREAT idea on the thermal imager!! My husband has one for work. We are going to use it. THANKS! when my food needs more drying time, how do I adjust my machine to do that? I’m sure there are more detailed instructions in the user’s manual, but when the machine goes through an automatic cycle, at the end of the cycle the finish screen comes up. If I remember correctly, it has a “Continue” button. You hit that, and another screen comes with three options – one of them being more drying time. Make sure the drain valve is closed, and add as much time as you think you need, using the arrows to adjust the time up or down. Can you please tell me if it is possible to freeze dry corned beef? I have been given several catering size tins of it and have only had the dryer 6 weeks. I don’t see why there would be any problem with it, unless it was exceptionally fatty. I would slice it thin, if it’s not sliced, for easier freeze drying and rehydrating. Is it possible to run a second freeze cycle without hurting the machine without defrosting it? After 10 hours freeze time and 10 hours dry time many of them are still tacky. We don’t have space in the freezer to defrost the unit. The machine has been drying at about 170 mTorr so it has a great vacuum. Can you add more dry time, or did you turn it off? If there’s too much ice built up on the unit, it can interfere with drying, so it’s generally not recommended to run two cycles back to back without the thaw. Could you stuff whatever you were drying in containers in the fridge for a couple of hours while you run the defrost cycle? It’ll likely gather a small amount of moisture, but it won’t spoil. We unfortunately don’t have any room in our freezer right now and the first batch of blackberries were 95% ok and we separated the other 5% and threw them away…but this time the berries feel like 70% of them dried properly. The ones that didn’t are still noticeably wet and we did the same settings…so guess we aren’t sure what to do other than separate what is good and throw away the rest. I was also worried about freezing a second time if it will harm the unit. The other concern is when they aren’t all 100% dry and if we miss sorting a few, it will cause the whole batch to spoil in the bag sooner wouldn’t it? It sounds like adding more dry time is the better answer if I understood properly. Thanks so much for your response it’s really appreciated! Environmental conditions also influence dry time. I generally let the unit run on automatic settings (9 hours freeze time and drying time based on moisture sensors). Drying time will vary by hours for the same food under different conditions. I know it’s fine to add drying time. I’m not sure about starting up a dry cycle with an icy drum. I can’t imagine it would be recommended, but I don’t think one time would damage the machine. You’d really need to contact Harvest Right directly to make sure you’re not voiding your warranty. Yes, I think if there are damp berries in with the dry berries, they will spoil. You wouldn’t have to freeze the berries while you thaw the drum. Refrigeration would be enough to keep them stable for a couple of hours. I had very uneven drying with my blueberries, even after attempting to pretreat them as you described, but folks are certainly welcome to try it out. My old food processor died after many years of service, and the new one doesn’t have a low speed so it either chopped the berries in half or didn’t touch them at all. I’ve taken my blueberries and freeze them in ziplock bags. Then after they are frozen, I take the bag out and play “wack-a-mole” with the bag. Just wack the berries to break the skins and put on the trays. Works like a charm. And you get to relieve some frustrations if you have any! If our freeze dryer gets done in the middle of the night is it okay to leave it until morning? The food may reabsorb some moisture from the ice on the inside of the chamber while sitting, so it’s better to add a few hours of dry time if possible. It won’t spoil if it sits, I’ve just had best results packaging ASAP when the cycle is done. More drying time and thinner slices. Both of those items are very high in moisture and have a fair amount of sugar. Odds are there was some residual moisture in the center of the pieces, which distributed through all the pieces during storage, making them soft. How should I determine the time adjustment for freeze drying fruit that I froze in my freezer? I usually just let the machine run its normal cycle. If you’ve previously run the fruit fresh and made a note of the time, then you could adjust the cycle based on your previous time. 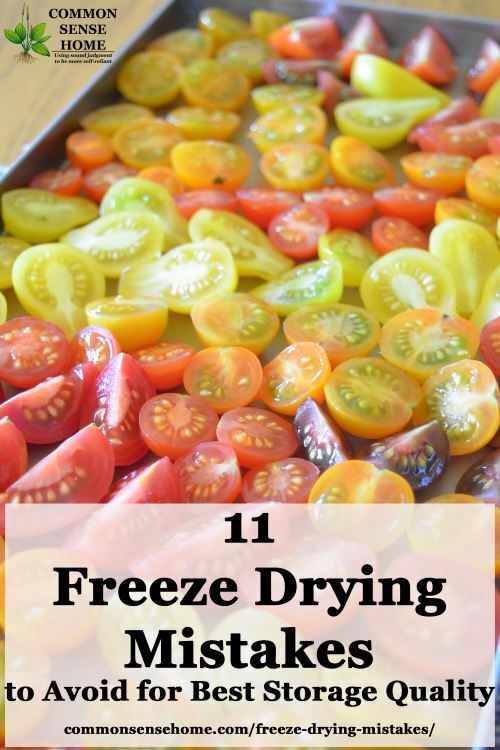 For instance, you might be able to reduce the freezing time by an hour or two and then have the same amount of drying time. 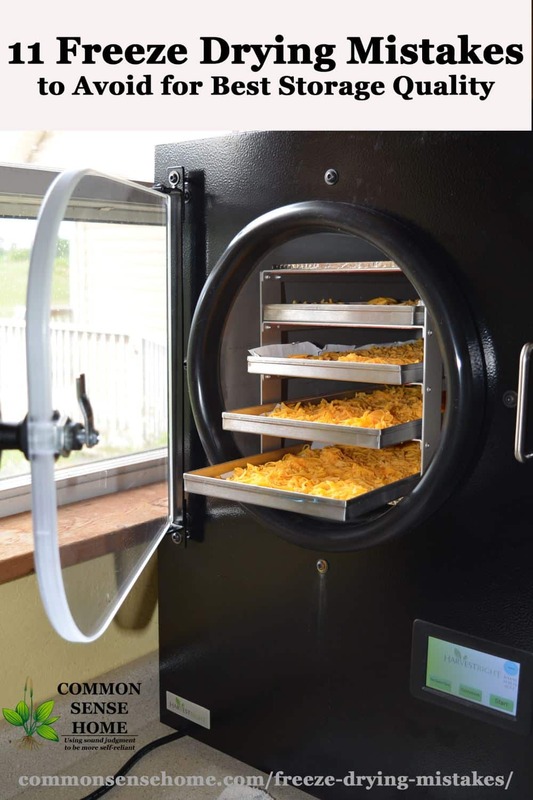 Have you ever tried jerky in a freeze dryer? Are you talking about freeze drying jerky that has already been dehydrated, or making jerky directly in the freeze drier? Making jerky directly in the freeze dryer won’t work. The meat gets powdery, not chewy. You’d have raw meats strips that crumble easily. If you want to freeze dry jerky that is already dehydrated, it may make the jerky more crisp, but any fat will impede the freeze drying process. It’s not something I would recommend. Laurie,we bought our Harvest Right Freeze Dryer about 3 months ago and have been almost continuously using it with no problems. We bought the extra set of pans and 8 of the silicone pads that go in the pans,they work real nice,the extra pans are to be used to have another batch ready to go when the current batch gets completed.We got the filter kit that Harvest Right Accessories.com has on the market,and that is a real time and oil saver,it has a spin on filter,like a regular car oil filter on it and has a drain plug at the bottom and when the cycle is complete just open the valves and let the water drain and close and start the next batch.I also am going to try the 700MI oil add to see if the oil spray stops,although since the filter addition have not had that problem.We have ran into a problem with it though,about a week ago the vacuum started going into the negative and it was not drying the food,so I took the filter out of system and tried and it still was not drying,call Harvest Right and on the phone went through trouble shooting and they said that the heat relay was bad and are sending us a replacement one,but he said that when it goes to heat cycle to defrost you will hear a click when the relay kicks in,and if you don’t hear it,then the relay is bad. Up until the relay went out the dryer was working fine and the food was stacking up. We also bought a 24’x24′ greenhouse from Harvest Right and bought the grow boxes from the garden Patch,they are real nice and handy,also have 2 1800w solar gen-sets and 3 100w solar panels and battery packs to go with them,and will be increasing the solar as time allows.We are trying to get as self sufficient as we can and off the grid as we go. Sounds like you made a lot of goof investments this year. thanks for sharing your experience. Glad you were able to figure out the issue and I hope it gets resolved quickly. Laurie,today we noticed a problem with one of the Zucchini that was freeze dried on 10/24/17,it was all swollen up in the Mylar bag,and all others in the Mylar bags still looked OK,the seal looked to be tight on the bag,any idea of what could have happened to cause the bag to puff as it did? would appreciate your thoughts on this. I’d suspect that it wasn’t as dry as it should be, and it’s fermenting and outgassing. You’ll find that if you want to freeze dry things like whole pork chops or chicken breasts etc, it’s best to freeze dry them raw. They will re-hydrate right back to meat market quality. Obviously you would have to cook / prepare to use but it will prevent shoe-leather meats like you get when trying to freeze dry thicker cooked meats. Limit thickness to 1/2″. As to liquids. If you’ve set your freeze dryer up correctly, the front will be set higher than the back in order to facilitate runoff of water during defrost cycle. In order to get around this problem, simply place the trays into your home refrigerator freezer and pre-freeze then load those pre-frozen trays into your freeze dryer. Just got my freeze dryer and started freeze drying. I have noticed the skin on strawberries is a little chewy. I just did a batch of scrambled eggs and they came out very chewy after rehydration, not good at all. What can I be doing wrong? It sounds like it’s not drying correctly, but why I don’t know. I haven’t run into that at all. By chance did you leave your finished food sit in the freeze dryer after the cycle was done, or not get it immediately into packaging when the cycle was done? The finished food will absorb moisture like a sponge, which could give it a chewy texture if it’s not store properly and quickly. For storage, the finished freeze dried food should go into a Mylar pouch with oxygen absorber, or mason jar with oxygen absorber (preferably vacuum sealed). You need something airtight, and you need excess O2 eliminated. A regular mason jar with just the lid screwed up is not good enough. A vacuum sealed mason jar will hold food for at least a year if the seal doesn’t fail. Laurie,if you recall,we had the same problem right we got our freeze dryer,and called Harvest Right about and they trouble shot it on the phone with us,and had us to go to heat setting and asked if we could hear a click sound and we couldn’t and the person said the heat relay was bad and sent us another one and have no problems after I installed the new hear module.That was exactly what was happening as Harry described.Wouldn’t hurt to run that diagnostic,might be the problem,if it is they will send a new one at no cost. Thanks, Layton. I had forgotten about that. I’ll get this comment live so Harry can see it. He just added another comment, too, noting that he kept the food sitting in the freezer for a while before freeze drying. Normally that wouldn’t be a problem, but maybe? I’m sure he’ll appreciate your input. The food was removed from the dryer right after the vac pump stopped and went into the Mylar pouch with oxygen absorber. I think I may know the cause. I placed the food trays in the refrigerator freezer for 3 days wail I was waiting for a late delivery of vac oil I ordered. I’m going to run a new batch today and put it directly in the freeze dryer and see if that fixes it. Normally pre-freezing isn’t an issue, but the refrigerator freezer does go through defrost cycles to keep it frost free, so that might be it. See Layton’s comment above about the issue he had with a relay in his unit. That would be the next thing to check. The relay is real easy to check,when you activate the heat cycle,there will be an audible click you will hear,and if it doesn’t click,then it is a bad heat module.It was surprising that it went out after only using it about 3 weeks. Looks like the main problem was the food was not completely dry and needed a couple more drying cycles. Pre-freezing for 2 days didn’t help. I think there may have been a little freezer burn. Pre-freezing only gets so cold, no matter how long you keep it in a regular freezer, so that makes sense. If it was in a freezer compartment (like a fridge freezer) with an automatic defrost, that cycles the temps to prevent frost buildup and shortens the food storage life cycle. I think I read somewhere that you can use a coffee filter & batting to replace the filter guts in the Harvest Right filter, when it gets dirty, but for the life of me I cannot find it again. Is that correct? All your tips are great. I always use 700 ml oil & only had one issue when I didn’t get a good seal on door & the sock tip saved me from a big mess. Now I rinse off the door seal and put it on leaving it a bit proud as you suggested right before I start a cycle. With the seal damp the contact area with the door shows up real well and we haven”t had any issues since. We are really looking forward to this years growing season as we got ours in the fall. Did get a few tomatoes, peppers, zucchini & apples done. Still it is getting used regular when bananas, pineapple etc goes on sale. I sliced & grilled pineapple then chunked & freeze dried. That is the best treat ever! Can hardly do enough to store any. Thanks for all your helpful info. I got my Harvest Right before they started including a filter, so I use an old Brita pitcher with a coffee filter and a section of a toilet paper roll, tightly rolled to fit in the filter opening. Works better than the Harvey Filter I tried originally. Hello. I am contemplating getting into freezing food. My question, after reading all your information here, what does this do for your electricity bill?? Did you mean freeze drying food, or freezing food? I’m guessing you’re talking about freeze drying, since you’re on a freeze drying page. I haven’t noticed a huge jump in our electric bill, but I don’t run our unit 24/7 like some people do. It depends on your electric rates, but would probably run in the range of $2-3 per load. I am interested in purchasing this freeze dryer. I’ve heard some comment that this device does not really save money, but I believe if you have a garden it certainly will….mostly in labor. It requires far less labor than canning…and is far less messy. 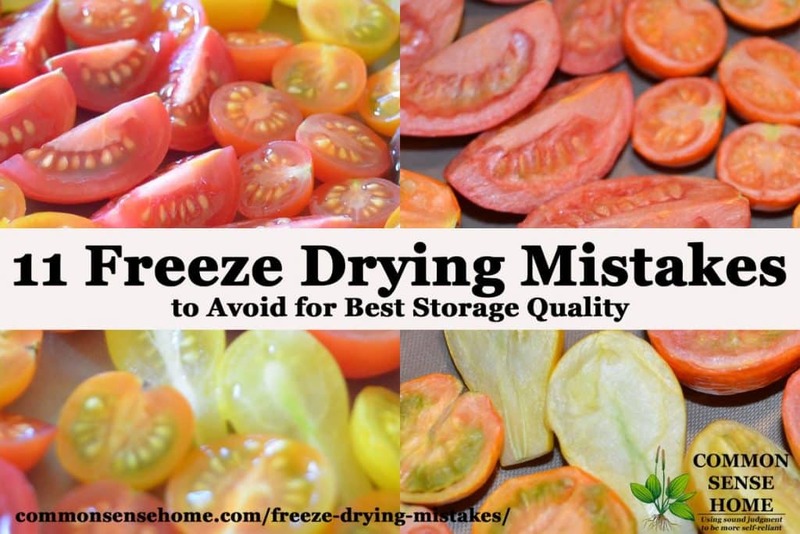 Secondly, if you freeze your produce from a large garden you need multiple freezers to store it and use electricity to run them, and you still have the labor of blanching vegetables and packaging them. If you package them with a vacuume sealer that is an additional expense. Additionally, if you have a power outage you can lose your whole harvest stored in freezers. That happened to me once after a hurricane and we lost power for a whole week. I cried as I threw all our food in the compost…Third, freeze drying retains more vitamins than any other method of preservation, so you get far more nutrition dollar for dollar…. which is the only way food value should be calculated. I could buy pounds of cheap food with no nutritional value but even the small amount of money I would spend would be wasted because I basically spent my money on food that is totally worthless. My question is that I am paranoid about not getting all the moisture out. Will the produce be adversely affected if I kept it in the freeze dryer far longer than recommended? In other words, can foods be ‘over dryed’? Thanks so much for all the very useful information you have presented here. People use a few different ways to check dryness. I generally break open some of the largest pieces and check to see if they are cold inside. If they’re cold, it’s not dry enough. If they’re room temp, I’m good to go. I’ve also heard of people using moisture meters, and infrared photos, which I think would be the best way to check. Any cold spots on your image and you know your load isn’t completely dry. Like any tool, you get out of a freeze dryer what you put into it. If you rarely use it, I wouldn’t get it, but if you are the type of person who does quite a bit of food storage, it can be a very good investment. I’ve been very happy with the food quality from ours, and the variety of foods I can easily store. Hi, were having trouble drying cucumbers for instance. Is the temp. too hot? They come out dry but you can’t re-hydrate them same with zucchini. Also we did black raspberries and ended up cooking them on the trays. Too hot, if so what should the temp be? Is there any resources for different foods, tips and tricks. Some foods are limited in how they can be used after freeze drying. From what I see in the comment threads, those who freeze dry cucumber and zucchini slices typically use them as dried chips for snacking, or they shred them and use them in cooked recipes. There’s no way to adjust the temperature of the cycle, only the length of the cycle. (You can do a longer freeze time or longer dry time.) I think I remember someone saying they did a longer freeze time on raspberries, because the seeds make them challenging to freeze and dry evenly. Foods with more consistent texture work best. I know someone who is working on a freeze dryer “cookbook” of sorts, but I don’t know when it will be ready. Laurie, when freeze drying beef stakes do you need to debone the stake before freezing drying? Yes, it’s best to debone any meats, and aim for uniform thickness. Laurie, when sealing a Mylar bag after loading it with freeze dried foods do you need to use a vacuum unit to remove the air, or do you just seal it with a hot bar sealer? Is there a benefit to using a vacuum unit over just a hot bar system without vacuum for long-term preservation? Thoughts? You can’t vacuum seal Mylar bags “as is”. Because they are smooth, there’s no way for the air to get sucked out when you close the sealer. (This is why vacuum bags are textured or have a textured strip.) If you want to vacuum seal a Mylar bag, you need to use a work around. I’ve seen people add strips of vacuum sealer bag in the channel, and others who use straws or other channels. It all looks quite awkward, with my vote going to vacuum sealer bag strips in the channel as least awkward. I tried that, and it was somewhat of a hassle, but it did work. Using a correctly sized oxygen absorber in your Mylar bag is much easier. Just drop it in an seal, and it removes the oxygen for you. My vote goes to Mylar or glass for long term storage, with an oxygen absorber in every container. I’ve placed a folded large towel to the full-bag side of the heat sealer and used another towel on top to gently squeeze most of the air out from the mylar bags before heat sealing, twice. I still use oxygen absorbers. Thank you for your excellent comments. I am the one who sold my small for a large size freeze dryer… but… it has been down for several weeks. Every cycle I did was 46 hours long (no matter what I put into it), and some of my food wasn’t dried. Your suggestions are excellent, but I think I have a problem with the seal. There is a tear in the foam insulation and the unit creates puddles on the floor from condensation (it is in a conditioned basement space, the same space I had my small unit it, never had any humidity problems). Anyway, I have been waiting on some replacement parts from Harvest Right, but so far they haven’t arrived (about 2 weeks). Guess I should have kept the smaller unit… darn! Something that Harvest Right said is although they sell the silicone tray liners, that the parchment works better for anything with a higher moisture content. I hate that, because the tray liners are so easy to clean and handy. So sorry you’re having issues with the larger unit. Before Harvest Right started selling their silicon tray liners, I ordered some reusable parchment sheets from Amazon and cut them to size. I use them for everything and they clean easily. They’re a little easier to crumple than silicon sheets, but if handled with reasonable care they hold up fine. I found regular parchment paper to be a bit of a hassle. *ahem *hint hint Harvest Right has an opportunity being presented to them to please their customers and still potentially make money. They can be the first to create the multi use parchment paper. Presented as a paper towel roll, perforated at the proper lengths to fit trays. This option also addresses the oversized parchment paper available to us in the stores as being to cumbersome to use or store so we opt out altogether. I need to make time to update posts. Not enough hours in the day. We did our first batch of onions a few months ago and cannot get rid of the smell. We did ice cream and apples afterwards (made days or weeks later) and they taste like onions! How do you get rid of this smell/contamination!? Personally, I’ve avoided freeze drying exceptionally smelly foods like onions. Given that the deed is done, that’s not an option in this situation. The problem is that the oils that cause the off flavor are now coating the entire vacuum chamber of your freeze dryer, and likely the drain hose, too. If you haven’t done it already, I’d suggest carefully removing the rack and washing down all the surfaces with warm, soapy water to remove the oils. If that doesn’t clear the odor, you may want to try something specifically designed for odor removal, like the options mentioned in this post – https://commonsensehome.com/best-odor-eliminators/. Hi! I am enjoying all the knowledge posted here! I just got my Harvest Right, and at some point during my freeze cycle there was a power outage (after at least the first 3 hours – maybe 4). I got it to resume, but am wondering if the food inside (mashed potatoes and cooked chicken strips) will be safe, or if spoilage may have occurred. We were away from home so I am not certain just when or how long the power was out. Any thoughts on this? Thank you. That’s a tough call. Could you tell if the chamber was still frozen when you started it back up? That initial freeze cycle gets really cold, so that would buy you several hours of safety. If you think it thawed and sat, I’d be a little concerned. Not sure – I did not open it, but it is pretty cold in our house (below 64)… The dryer did not warn me of any potential danger, but gave the message “Restarted after power outage”. The dried food looks fine, for whatever that is worth :). We were gone about 6 hours, but not sure when error occurred. I think it resumed at 5+ more hours of freezing to go. Thank you again. If you’re curious, the first part of the video below demonstrates how to download the data log from your unit, which you could access in Excel to check the down time and temps. I really want a freeze dryer but I’m afraid of not getting the result I want. I will only be using it to freeze dry raw meat for my dogs. I need to be able to freeze dry raw meat patties then be able to put them in a reclosable plastic bag and take them with me on trips. The meat will need to remain in a solid state without being vacuum sealed. When I feed the dogs I will need to be able to break up the patty and add water to it to make it moist. I will also freeze dry raw meat treats for them like sliced turkey hearts. I bought a package of freeze dried turkey hearts last July and they are still good without being stored in a vacuum sealed bag. That’s what I want but I’m not sure that this freeze dryer will give me that. Can you advise me? The quality of home freeze dried products should be as good or better than commercial products. Ideally, I’d still recommend vacuum sealing in a jar (or using Mylar) for the products that you are not using immediately. You can do this with your freeze dryer if you don’t have a separate vacuum sealer. The fattier the meat, the less shelf stable it will be. Extremely lean meat will last longer, even without vacuum sealing. When you say the hearts “are still good”, I assume you mean they look the same and aren’t showing obvious spoilage. Even with commercial products, it’s best to use them within a month or two of opening a container for best quality. At nearly a year old, freeze dried or not, those hearts are no longer at best quality. I realize you can’t taste the meat (without cooking it) since it’s raw, but you might want to try giving it a close smell or having other people smell it. After months exposed to oxygen, I would expect it to be slightly rancid, even with freeze drying. There shouldn’t be an issue with not vacuum sealing freeze dried meats that will be used within a month.